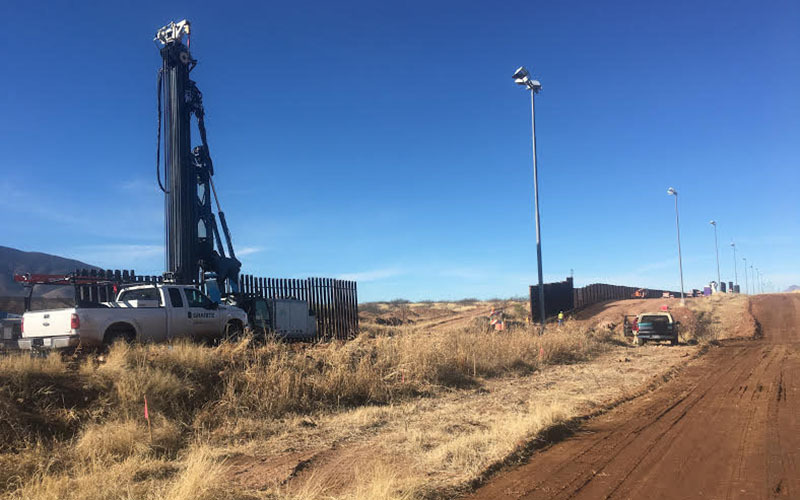 Phoenix — As the bidding war for the construction of President Donald Trump’s wall comes to a close, many environmental activists remain concerned over the potential impact it will have on wildlife and ecology on the border. “The north and south mountain ranges serve as wildlife corridors and a border wall and related militarization essentially cut that in half,” said Craig Miller, Senior Southwest Representative of Defenders of Wildlife, a conservationist group. “That has significant and long-term, and in some cases permanent consequences for wildlife and the habitat. 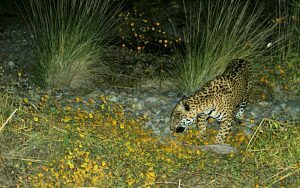 Jaguars, black bears, mountain lions – the list goes on and on. We’re just beginning to understand the impact of severing those wildlife corridors,” Miller said. More than 700 species of birds, mammals and insects migrate through the borderlands each year, according to the Sky Island Alliance. At least 450 rare species live in the borderlands. One hurdle for many environmental activists is the 2005 Real ID act, which waives U.S. Border Patrol’s obligation to follow certain environmental and cultural laws that exist on the border. Former Secretary of Homeland Security, Michael Chertoff, waived at least 37 of these laws. “I think that those laws being laid are devastating, and not taking a look at these resources on our public lands,” said Louise Misztal, conservation director of the Sky Island Alliance, an environmental activist group focused on the Sky Island region in southeast Arizona. “There’s all sorts of springs and sacred sites that are in the public lands in the Sky Island that were protected in those lands because they’re really gems of the nation and the laws and infrastructure damage those sites,” Misztal said. No other Secretary of Homeland Security has authorized the use of the Real ID act. Dinah Bear is a board member of the Border Action Network and practices environmental law. She said some in government believe the Real ID act is a governmental overreach. “People are being deprived of their normal opportunities for normal review of proposals for protection of environment and communities,” Bear said. Even the U.S. Border Patrol has criticized the Real ID act. The Real ID act has faced challenges from organizations such as Miller’s Defenders of Wildlife, but none have undergone judicial review. Despite this, Miller said he has seen improvements in ecology around the border recently and is the result of 30 years of binational cooperation. But he is afraid this cooperation will go to waste if an all-encompassing wall is built. One recent example of this is the reintroduction of the Mexican gray wolf into Northern Sonora and Southern Arizona. There are only two populations in the wild and one is in Arizona and the other is on the eastern slope of Sonora. Miller said further splitting of these two populations could be detrimental to the species’ survival. He also said despite the difficulties he and other environmental activists face on the border, the U.S. Border Patrol has historically recognized the importance of wildlife crossing across the border. Walls are not the only thing threatening wildlife and ecology in the borderlands. Roads, foot traffic, vehicle traffi, and even air traffic can affect wildlife and plants in the borderlands. In addition to the Mexican gray wolf, the borderlands harbor a diversity of animal and plant species. Many are endangered or threatened because of the current infrastructure along the border, Miller said. An extended wall could potentially be even more harmful to those species. He said many animals cross the border to get to hard-to-find resources in the desert. Many species’ traditional migration routes cross the international boundary. Some examples of animals threatened by increased border security are the ocelot, northern jaguar and black bear. Border walls even affect birds like the pygmy owl, which has a tendency to fly at low altitudes. Amphibious species that live near waterways on the border, such as the Sonoran Desert Toad, are unable to cross border barriers. This phenomenon can result in “inbreeding depression and behavioral oddities” in many species. She said the Sky Island Region is particularly susceptible to damage caused by border infrastructure. Misztal said she agreed the work she and others have done in the border region could be in jeopardy. The harmful effects don’t just pertain to habitat and wildlife. Communities around the border can be indirectly affected by the exacerbating ecology. Other problems border structures can cause include preventing seed distribution and genetic diversity across the border as well as flooding along the wall. Any structure can act as a dam for rainwater. Misztal said many politicians make misinformed judgments about the borderlands because they are not familiar with them. “A lot of people around the country don’t necessarily understand what the landscape looks like around here and it’s a really wonderful, beautiful diversity of plants and animals that live down here,” Misztal said. “I think it’s a really important natural resource of our country and is important to protect and keep functioning. “People don’t usually think of desert areas being diverse and full of life but they definitely are down here,” she said. Nogales, Ariz., mayor John Doyle said he has experienced flooding due to the current wall and infrastructure on the border.